CROSSLINE is a pulpy sci-fi adventure with action, humor, great characters, and a few funky plot twists. Hotdog pilot Marcus Powell has been selected to test Taurus Enterprises’ Crossline and its newly developed warp thrusters, which, if successful, will revolutionize space travel as we know it. But during his psychedelic jaunt across the stars, Powell is forced into a parallel universe, where he finds himself at the center of a civil war he may have been destined for all along! Teamed up with a gorgeous, trigger-happy rebel leader, a pot-smoking Shaman, a crafty pie maker, and a weary soldier who hates his guts, Powell must survive a cross-country rescue mission and his own trippy vision quests long enough for his wife and young daughter to outsmart Taurus’ reclusive CEO, whose own secrets may prevent Powell from ever making it back to Earth. 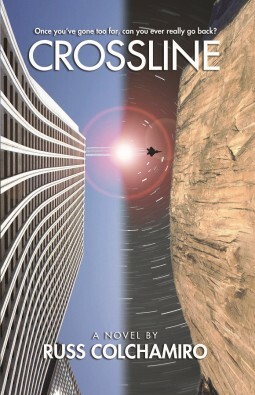 From author Russ Colchamiro, Crossline is a hilarious, action-packed romp across time, space, and dimension that asks the question: once you cross the line, can you ever really go back?